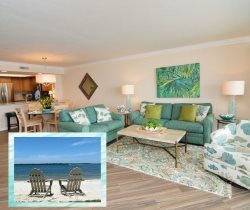 Exclusive beach view condo connects with unit next door through the living/dining areas! Book both units for a family reunion, ladies retreat or any family needing more sleeping or living space. Upgraded Kitchen and Bathrooms kick start this great unit and then match it with outstanding water views from the screened-in 10th floor balcony! The master bedroom has a King bed, guest bedroom has a queen bed and the living room sofa is a sleeper. HD flat screen TV’s in the living room and both bedrooms. The kitchen features stainless steel appliances and granite counters. Our Sanibel Harbour rentals on the beach are well-appointed with a delightful palate of neutral, cranberry, dark yellow and green tones to make up an appealing Florida-style décor. You may have found this rental on HomeAway 4363830, HA ID 4363830, VRBO 4363830ha, or Vacation Rentals 4363830.